Two-part expanding foam, great for fin encapsulation, securing noseweight, etc. Includes (2) 8-ounce bottles. Tip! Humid air and moisture will change the density of the foam. For a longer storage - squeeze the excess air out of the bottle once you use some & replace the cap with bottle still squeezed to keep it out. Once bottles become 1/2 empty or more transfer to smaller bottles. 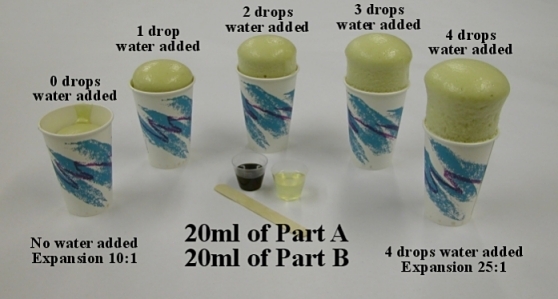 The photo for this product is a photograph showing the results of adding various amounts of water to the mixture of foam. The difference of just adding one drop of water is dramatic. Keep in mind that if you double the batch size, you will need to double the water amount to achieve the same expansion ratio. A little experimentation is highly recommended before actual use in your project.